One of the many things we love about Morzine Avoriaz is that it is forever changing, growing and evolving. Each winter season we have new and exciting bars, restaurants and activities opening. We’re extremely lucky that we live somewhere that will always have skiing, snowboarding, biking and adventure at its core but a town that is constantly moving with the times. One of the big changes heading our way is the après scene. We already have a strong après set up, however, this winter a Folie Douce will be opening in Avoriaz. If you haven’t heard of the Folie Douce then I’m seriously surprised. La Folie Douce is a famous brand of high-altitude disco restaurants, that are well known for their massive parties. The chain was started by Luc Reversade and completely dominates the après scene in Val D’Isere, Val Thoren, Meribel, Saint-Gervais and Alpe D’Huez. 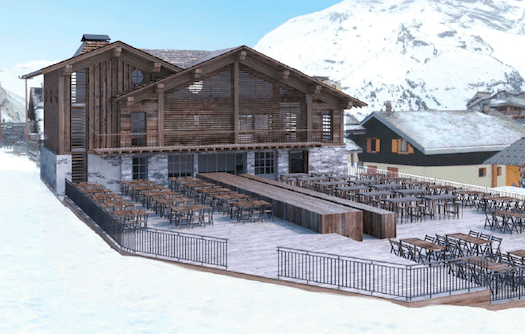 The Folie Avoriaz will be located inside an entirely new building on the site of Chez Lanvers, next to the Yeti on the plateau in Avoriaz and includes a huge new terrace. The Folie Avoriaz will include a self-service restaurant La Petite Cuisine open from 11:30am until 3pm and the fancy La Frutiere restaurant that will be open for lunch and dinner. Apres will kick off at 2pm every day with DJs, singers and performers whatever the weather. If you’ve never been to a Folie, then you should 100% go as Luc Reversade has managed to create the atmosphere of an Ibiza night in broad daylight at high altitude. If the success from their other venues are anything to go by the Avoriaz après scene is about to be elevated. However, the big après venues in town such as La Kinkerne and Happy Hours will always be the locals favourite and tough to beat. The Kinkerne will be hosting Folie Douce after party events throughout the week so if you’ve got still got the flavour, make sure you pop in! IS A NEW LIFT COMING TO TOWN? Following rumours as far back as 2009, it was announced that a new cable car would be built, starting from the centre of Morzine travelling up the Ardoisieres valley and joining the Prodain 3s cable car to take skiers and snowboarders all the way up to Avoriaz. The proposed project, as far as we’re aware, won’t change too much of town as we know it – apart from changing our beautiful views up to Avoriaz. Aside from two new parking structures, and the gondola station. From the Mairie’s perspective, the new lift will reduce buses needed in town throughout winter, car traffic, parking issues and overcrowding on buses. However, nothing has been confirmed as of yet but word from the Mairie is that we can expect an announcement very soon. The festival that kicks off at the start of the season will be celebrating their 10 year anniversary this winter. To celebrate they’ve rebranded themselves and will only take place in Avoriaz between 14th and 16th December 2018. The weekend will be based on an 80s theme so expect old school competitions such as a hot dog mogul field and much more! The board test will remain at the heart of the weekend, with a choice of over 60 brands to try. However, this year the festival will also include workshops, activities and entertainment including free ski and snowboard screenings at Avoriaz cinema and parties in the evenings.